Pocket Mariner’s Dual Band AIS receiver comes with a lan cable (RJ45) , aerial connector (MCX, BNC or SO-239) and USB cable/connector. It measures approx 10cmx7.5cmx2.5cm (4” x 3” x 1”) and takes less than 1W of power. It has a very good range and compares favourably with commercial AIS receivers costing upto 3 times the price. It requires no configuration and will work without needing to be connected to a PC. Simply plug your AIS aerial lead into the aerial connector, connect to a lan port on your router and connect the 5V power supply or power it via the mini usb cable. The unit will show a solid blue light (by the power connector) which transitions to flashing blue lights and then after about a minute it will start transmitting the AIS data over the lan and usb cable. This is a great successor to Marine Gadgets AIS USB Stick which is unfortunately no longer available , priced at the same price and being dual channel will pick up targets twice as fast. We have had an independent test carried out and our AIS receiver compares very favourably with mainstream commercial ones costing over 3 times the price! Use the USB cable to view the AIS data on a local PC, Mac or Android device with an AIS app like ShipPlotter for PC , our Boat Beacon App for Android or our SeaNav app for Mac which has US, CA. UK , IE ,FR,DE NL and BE digital charts available. There is also OpenCNC for PC and Mac ( http://opencpn.org/ocpn/) etc. 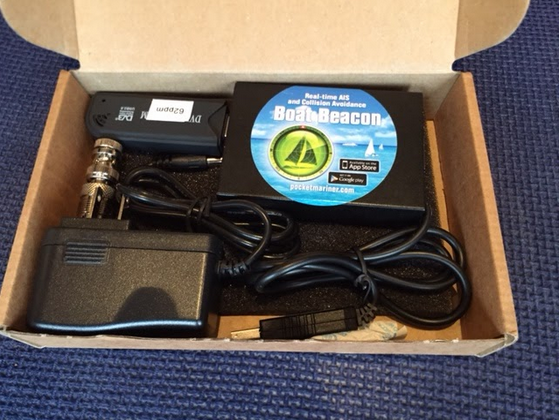 More details on using it with an Android device here:- http://pocketmariner.com/boat-beacon-now-supports-ais-direct-from-a-vhf-ais-receiver-too/. Where xxxx is a dedicated web page for each receiver. You can also view your data on our free Boat Watch app or Boat Beacon app for iOS devices. If you are using a desktop AIS app like ShipPlotter you can use its internet sharing option to forward data to other folks. We can also forward your AIS data via our service to other internet AIS services like AISHUB, Marine Traffic and ShipFinder etc. via UDP or TCP. No need to worry about eating into your Broadband connection, the data rate is very low , typically less than 2kbit/s for over 100 ships in range.